Jean Renoir’s Grand Illusion currently being revived at Film Forum is an essay on identity politics of the most loving and global kind, which is to say a kind of identity politics that doesn’t exist today. All the elements of race, class and religious background that separate men are fully at work in the film and yet are ultimately assertions of the humanistic or liberal premise that there can be an empathy and unity of purpose amidst difference. Still differences are literally what makes horse races. 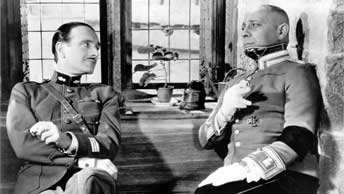 The two aristocrats de Boldieu (Pierre Fresnay) and von Rauffenstein (Erich von Stroheim) are denizens of the same Parisian restaurants, Maxim’s and Fouquets, and also share a code of honor. “Je vous demand pardon,” von Rauffenstein says, after shooting his counterpart. De Boldieu sloughs off the apology. It will be all over for the Frenchman, but it’s von Rauffenstein who will have to carry on. However the grand illusion itself is ambiguous. On the simplest level, it’s an illusion that men are separated, but the term is also ironically employed to the extent that the notion of conflict and war ending is also a grand illusion. The film has a picaresque quality that’s almost reminiscent of Candide, particularly when the working class Marechal (Jean Gabin) and the Jewish Rosenthal (Marcel Dalio) find an idyllic respite in the middle of their grueling escape to Switzerland. It’s reminiscent of Voltaire’s ironic reiterations of Leibnitz’s reality defying optimism, “all’s for the best in the best of all possible worlds.” When Gabin says goodbye to the saintly German widow, Elsa (Dita Parlo), who has taken him in (and has become his lover), we know that despite all the protestations, these two will never see each other again. The gap between the worlds they inhabit is too great.